OPPO’s is an innovative manufacturer who launched their mid-range F-series line-up two years ago. The Chinese phone manufacturer keeps its F-series photography focus and is known for its selfie centric devices. The company launches F-series smartphones in a 6-month cycle and is set to launch a new F-series smartphone soon. Dubbed as the OPPO F9, it is the successor to the OPPO F7 launched in March this year. The company will also be launching a higher variant called OPPO F9 Pro with slightly advanced and powerful specifications than the regular variant. The OPPO F9 and the F9 Pro recently received Bluetooth certification (version 4.2) on July 18 with model number CPH 1823, CPH 1825, CPH 188. The device with model number CPH1823 will be called OPPO F9 Pro while the other two will be regular variants with different memory configurations. OPPO also launched a teaser revealing some key details about the optics department. Unfortunately, the teaser didn’t mention the launch date or other specs. OPPO F9 sports the same Bluetooth module as OPPO A3, OPPO A 73s, OPPO F7, OPPO F7 Youth, OPPO R15 and Realme 1, which hints that it will be powered by the same MediaTek Helio P60 chipset (MT 6771). Other specs were not mentioned except for cellular connectivity standards like GSM/GPRS, WCDMA and FDD-LTE. From the teaser, it was revealed that the OPPO F9 will sport dual camera setup on the rear stacked in a horizontal position with an LED flash on the top left corner. This is a big upgrade from the single rear camera on the F9. Also, there is a possibility that the front will sport dual camera setup too. Being a selfie-centric device we can expect it come with AI packed beauty enhancing features like AI Beauty, scene detection, object detection. Like the F7, it will have gender and age detection along with self-learning capabilities from user inputs. There will be more Augmented reality stickers and other features. Since the OPPO F7 made it to international markets including India, we can expect that the OPPO F9 and the F9 Pro to do too. 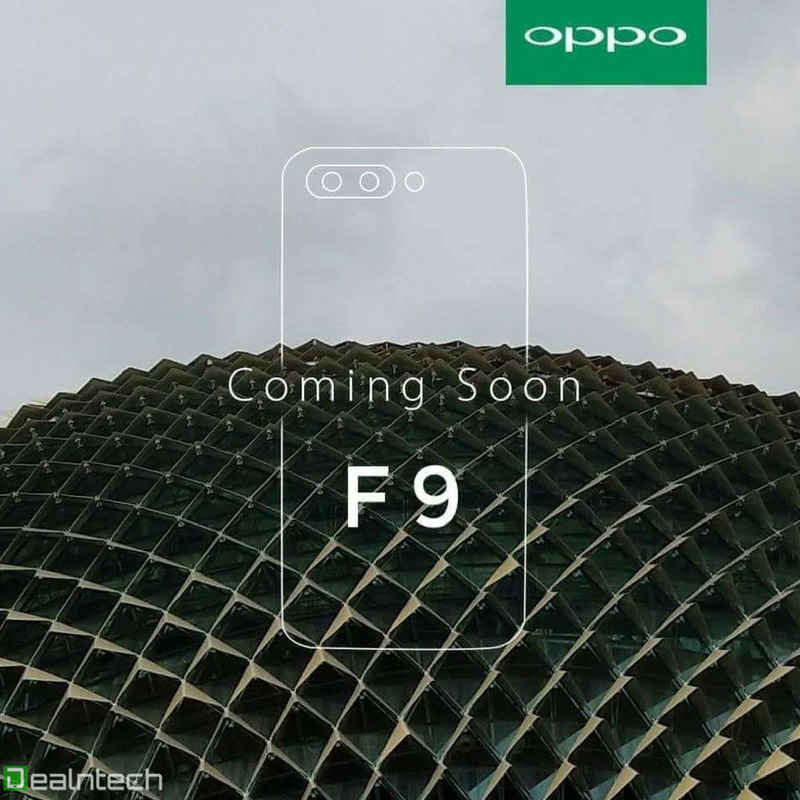 The timeline indicates the OPPO F9 to be released in October or November but rumours indicate that the company will be launching them early in August. Now, it will be interesting to see if there is a major upgrade other than the optics department. As for the pricing, the OPPO F7 came at a price tag of $320 (Rs 21,990) and $291 (Rs 19,990) for the higher and lower variants respectively. Since it is a direct successor with a very small time gap, we expect it to be priced similarly. We expect the company to give an official word soon. As we approach the launch date, the smartphone will definitely turn up in benchmarking site revealing other specification. Till then, stay tuned with dealntech.